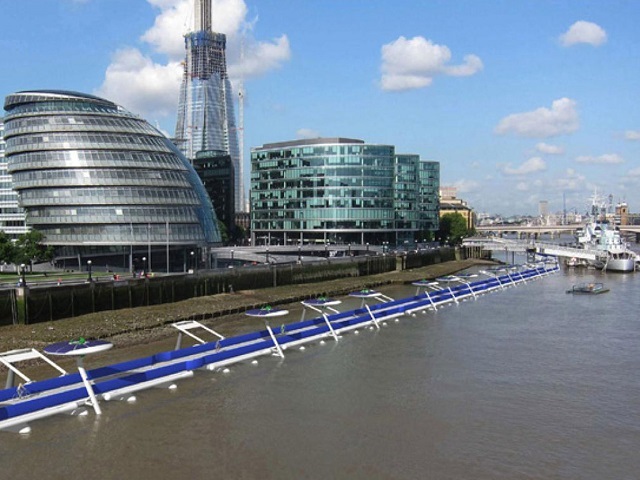 Friday Fun: Is the future for London’s cyclists on the river, the street, or both? Would you be happier commuting on a bike path floating on London’s River Thames? Photo by Chris R/Flickr. TheCityFix recently examined some of the most innovative bicycling infrastructure projects in cities worldwide, but a recent proposal for an eight-mile floating bike path on London’s River Thames might top these in originality. The “Thames Deckway” would cut through the heart of the city and connect Battersea and Canary Wharf – about a 30 minute ride. It would have two bike lanes in each direction during rush hour, and would open one lane in each direction to pedestrians at other times. On weekends, the path may host pedestrian-only days with vendors along its edges. This floating bike bridge will not come cheaply. The River Cycleway Consortium – which announced the project proposal – believes that it could be completed within two years, but estimates that it will cost £600 million (US$ 967 million). It also faces a number of other challenges including keeping cyclists safe from inclement weather and boats. The proposed Thames Deckway would connect two business districts in London. Rendering via River Cycleway Consortium. Despite success with pedestrianization, congestion pricing, and a number of other advancements for sustainable mobility, London still has severe air pollution and traffic congestion. In a statement announcing the proposal, the River Cycleway Consortium said, “London needs to think outside the box of conventional solutions to solve its deep-seated traffic and pollution problems.” The proposed Deckway, though perhaps not as practical as separated bike lanes on London’s streets, could give London’s cyclists an awe-inspiring commute. Is the floating bike path a sustainable solution or an expensive distraction? Critics have called the Thames Deckway proposal – and its intimidating price tag – hilarious and insulting. While it can add an additional option for the city’s bikers, they argue that it would create a single bike route for the price of an entire network of bike lanes. The Deckway is not the only cycling infrastructure improvement that could soon come to London. Mayor Boris Johnson recently announced an 18-mile protected bike lane that would travel alongside cars. At £47 million (US$ 75 million), this plan would cost less than one-twelfth as much as the proposed floating path. However, it has received fierce opposition from driving advocates. Despite often facing resistance, making space for active transport can lead to healthier cities with higher quality of life for all. In addition to reducing air pollution and easing congestion, separated cycle lanes save lives. Nine bikers have already died on London’s streets this year. According to the Mayor, bikers account for 24% of the city’s rush hour traffic. 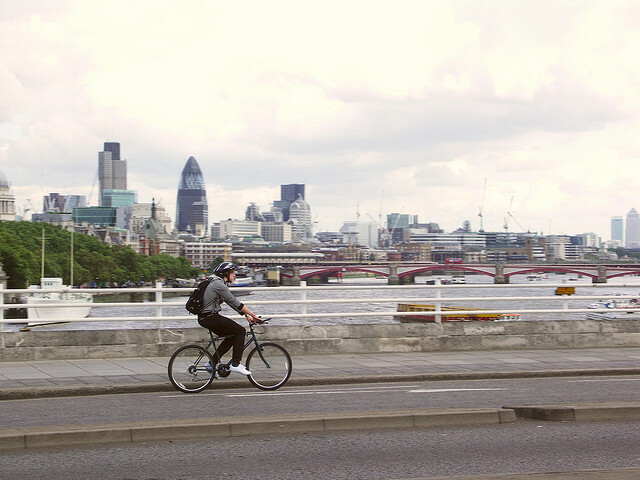 Whether over the Thames, through London’s streets, or both, cyclists deserve a safe commute. Though not as cost effective, the Thames Deckway is not mutually exclusive with London’s other efforts to improve cycling. The River Cycleway Consortium plans to privately finance its cost. To attract private investment, the Deckway would charge £1.50 (US$ 2.42) for access. Large, innovative biking infrastructure projects are becoming more common in cities worldwide. In Copenhagen, a cycling superhighway has helped increase biking’s modal share to 41%. In Portland, the world’s largest multi-modal car-free bridge will help connect the city’s growing Southeast region with downtown. Finding new ways to making biking easier and safer is an important part of people-oriented cities. While these cities lead the way, the most important improvements for cyclists in many cities will come from simple, proven strategies to separate bike and car traffic. Significant improvements do not require enormous investment; rather they require a commitment to sustainable transport over car usage.